“We may have all come on different ships, but we are in the same boat now.” Martin Luther King​. 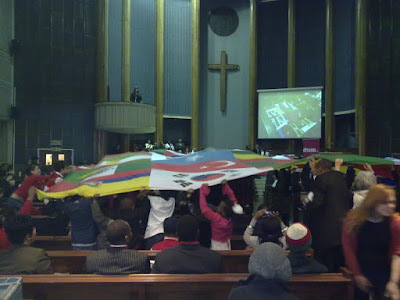 On Saturday 10th December 2011 we witnessed the making of history; more than 550 community leaders gathered at City Temple, London representing 50 Diaspora communities from across the United Kingdom. City Temple was site of a speech made by Martin Luther King nearly 45 years ago and 10th December was International Human Rights Day. It therefore made perfect sense that it was on this day and in this location that we held the inaugural Diaspora Peoples’ Assembly. On a bitterly cold morning all those responsible for the day gathered bright and early ready to make their plans into a reality. Clad in smart dress and sharp suits one could easily tell something special was on its way. Some were on their phones texting, calling, posting messages on social media or even tweeting – all about nothing but about the Diaspora Peoples’ Assembly. History was in the making and it was for them to make sure as many people as possible were able to be part of the momentous occasion. It was like a family having made everything ready for the wedding of their beloved one and anxious about the reaction of guests. Will they come? If so, will they love it? Of course the action is in the reaction! Those not preoccupied by their phones were decorating, testing, practising and rehearsing to make that day memorable. Yes they were all anxious to make the assembly a success; because history happens only once. As the day passed everything started to come together; of course some of those responsible for the event were still unsettled and hence the calling and texting continued until the eleventh hour. Delegations started coming one after the other and the first big batch to arrive was Shepresa of Albania, full of energetic and organised people. They were followed by the Chinese, Zimbabweans, Latinos, Ethiopians, Eritreans, Ghanaians, Somalis, Taiwanese, the Kurds, the Hazaras and many others from Africa, Asia, Europe and Latin America. Whilst the delegations were taking their respective seats, VIP reception was taking place down stairs with mouth watering food served by the Bangladeshi Caterers. The programme started with songs from Zimbabwe and Congo and a church choir from Ethiopia. It was amazing – eye catching and heart warming. It was followed by what makes Citizens distinct; the roll calls. This was especially important for most of those in the hall as they would see their flags being flown for the first time, or after many years. All those who made it to the stage loved it and showed their pride; communities were so happy and you could tell from their faces and shouts how important that moment was for them. The roll call was led in by the charming Chinese lion and led out by the Ethiopian Drummers. The roll call was followed by recognition of leaders who worked hard to make changes happen. And subsequently by business and politics; leaders liaising with MET Police, the Office of Immigration Services Commissioner, Reliance, Oxford, Cambridge and RSA Examinations Board and last but not least with Simon Hughes MP, deputy leader of the Liberal Democrats​. Those who responded to “the asks” were willing to work with Citizens. It was hard to say no for them in front of such organised Citizens. My colleague says, “The bigger the turnout, the more powerful we are.” Yes we were powerful on that day and will be even more powerful in the future; because we have broken the silence. I still have Simon Hughes MP in my eyes responding to the asks by British Overseas Citizens. Business done and relationships built.Then came the amazing garment of destiny; the giant flag. It was phenomenal! By far the best moment of the day. It changed the mood of the hall. The amazing singer sung about Diaspora power, some of those shouted while still others tried their best to touch the giant flag. Yet some were recording thimomentous occasion. They were right to do it as they needed their treasure because history was in the making and it happens only once.